Xtratufs are as common in Alaska as the Stetson is in Texas. The brown neoprene boots are the last rubber footwear made in the United States. But production of the boots is moving out of its plant, and officials in the city where Xtratufs are made say the jobs are going overseas. The boots have been around for years and they’re everywhere. Including at Sitka’s Eliason Harbor. Paul Yanak owns the Sequoia, a 56-foot wooden fishing vessel. He said Xtratufs are as important to fishing as anything else on board the boat. 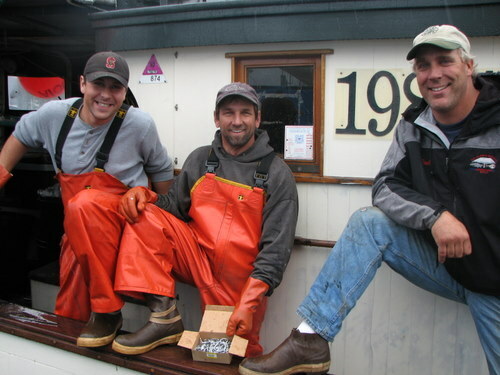 Onboard, a couple crew members listen to an iPod and prepare bait before they go longlining for black cod. One of them is Mike McVay, who is wearing Xtratufs, just as he has since he started fishing in Alaska 19 years ago. So news that Xtratuf’s parent company, Honeywell, plans to move production overseas, came as a surprise to McVay. But he says the boots are so ingrained in Alaska culture that moving the manufacturing operation shouldn’t make a big difference to their popularity. “If they’re still readily available, then the news is not all bad,” he said. Xtratufs were first made by the B.F. Goodrich company in the 1950s. And in the 1970s, production moved to a plant on the Mississippi River in Rock Island, Ill.
Honeywell Corp. bought the brand in 2008, and the company confirmed it’s moving Xtratuf manufacturing out of the Illinois plant by April at the earliest. Most of our specific questions went unanswered, such as where the boots will now be made, or how many U.S. jobs will be affected. Pauley says his office got wind of the company’s plan about two or three months ago. He says about 45 Honeywell employees will stay in Rock Island to work on products other than Xtratufs. If Xtratufs are most visible in Sitka’s harbors, maybe the second biggest collection of the boots is at Murray Pacific. The large store deals in fishing gear and is one of Alaska’s biggest Xtratuf dealers. Linda Boord manages Murray Pacific. She’s standing in an aisle where hundreds of pairs of boots are on shelves, lying on their sides, like freshly caught fish at an open-air market. “At a given time we probably have about 300 pair on hand, and we sell them all year round,” she said. She heard the boots will be made overseas from the Xtratuf sales rep who visits her two or three times a year. As a result, she’s stocking up. Other retailers also have concerns. And when that label goes away, Hayes says he has some questions. He presumes, for example that by moving the manufacturing overseas, the company will save money. And he wonders if that savings will be passed along to retailers, so they can pass it along to customers, who might expect lower prices once they know that the boots aren’t made in the United States anymore.